Eleven years ago, Chicago singer-songwriter Devin Davis released one of my favorite records of 2005, Lonely People of the World, Unite! — a one-man studio masterpiece — and I’ve been waiting for another Devin Davis record ever since. He’s told me that he’s been working on music, but not to expect anything anytime soon. Another promising Chicago musical act, a quirky group called Baby Teeth, called it quits in 2012 — and its frontman, singer-keyboardist Abraham Levitan hasn’t released a record since (though he founded the Piano Power collective of music teachers and co-hosted a monthly game show at the Hideout, Shame That Tune). Now, Levitan has teamed up with Devin Davis, forming the duo Teletype, with a full-length album called Spontaneity out today on iTunes. In late 2013, Abraham asked Devin if he wanted to try some Postal Service-style remote collaboration. Abraham had a new batch of songs he was excited about, the result of a recent residency at Chicago’s legendary club, The Hideout. He thought Devin would be the ideal collaborator for bringing the songs into Technicolor. Despite their living about a mile from each other in Chicago’s Logan Square neighborhood, each was intrigued by the idea of working remotely. The concept of remote collaboration isn’t the only way Teletype resembles Postal Service. 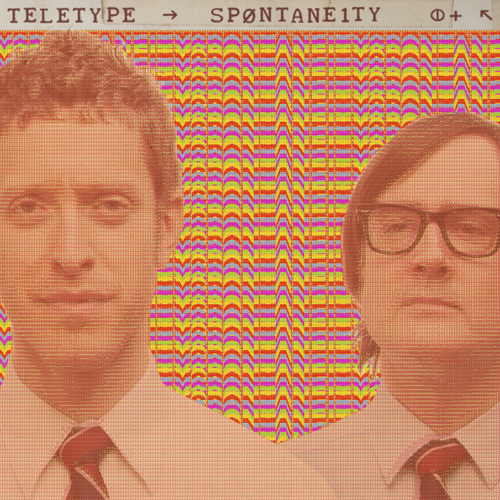 Like that band, Teletype evokes an earlier era of synthesizer-based pop hits. But Teletype’s Spontaneity draws on a wider range of genres and influences, from 1970s Queen records to Elvis Costello, the Pet Shop Boys and Oranges and Lemons-era XTC. At least, that’s what it sounds like to me. In its own press release, Teletype cites other influences — Paul McCartney, Elton John, Leonard Cohen, Pink Floyd and The Band. Levitan proves himself a strong songwriter here, with sturdy melodies and smart, well-crafted lyrics. And Davis shows that Lonely People of the World, Unite! was no fluke. He’s a master of constructing multilayered rock songs in the studio. These songs are filled with sonic touches and flourishes — at one second, it’s an acoustic guitar or something resembling a harpsichord, at another moment, it’s the deep gurgling noise of some sort of synth. And yet, these arrangements don’t feel too busy. Davis and Levitan have countless sonic ingredients at their disposal, but they’ve chosen well when they’ve decided what to put in each layer. While their joint public appearances are exceedingly rare, rumor has it that Teletype will be celebrating with a record-release dinner party at an undisclosed location.